WHERE HAS THAT FILE GONE?? In a very real sense competent file management is the key to being an effective computer user. File management skills are essential for managing the organization of Word documents, and the same skills are required to be an efficient user of email and the Internet. Both email and Internet Bookmarks (or Favourites) use basic file management principles to organize address books. 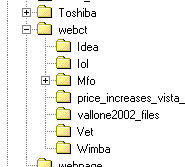 These notes will refer to the Windows Explorer area of your pc. 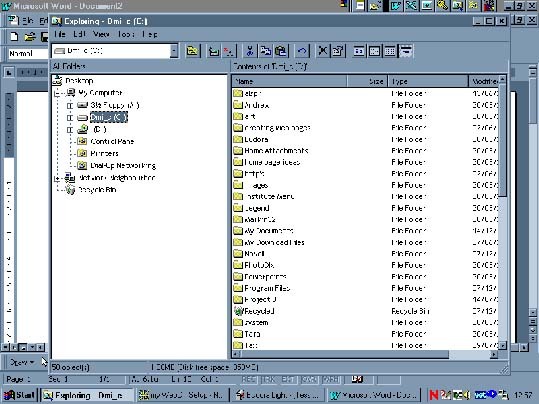 Its advantage over My Computer is that it has a split screen view that allows easier movement of files from one folder to another. Note: Windows Explorer and Internet Explorer are not the same thing! Windows Explorer is an area of every pc using Windows. 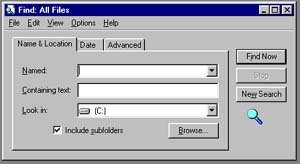 Internet Explorer is a browser (software) for viewing the Internet. How to find Windows Explorer? · Note split screen – left side has the main categories, the right side shows what’s inside the highlighted category. · Highlight the category you want to create your folder in e.g. first get drive right, then open folders inside that drive if appropriate. How do you find a missing file? It really is quite easy. you can type in approximate titles too. If you know the file was called 'aged something or rather' just type in 'aged' and it will more than likely find the file you are looking for. Try it. From here you can double click on the file you want and it will open, but it's a good idea to note the path of the file. From the image above, c:\Program Files\Adobe\Photoshop 6.0\Samples is the path of the file called 'Aged Photo'. The path tells me exactly where the file is on my computer. If you want to move the file to some other location, double click on it to open it and then file > save as to save it to some other folder where you will be easily able to find it again. A folder called 'aged care photos' or something easy to identify would be good in this case. HOW DO FILE MANAGEMENT SKILLS HELP YOU TO USE INTERNET BOOKMARKS/FAVOURITES? Both terms refer to those sites you want to be easily able to find again later. You can of course just simply keep adding to your bookmarks or favourites list but eventually you will end up with a long messy list that begs for some order. Here's how you do it. 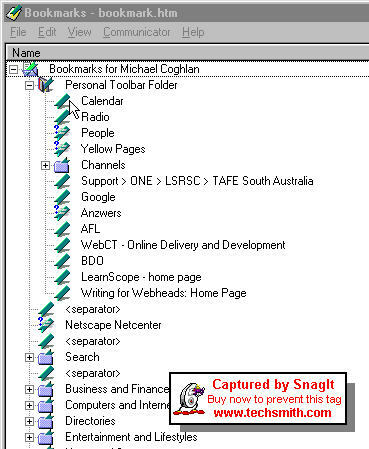 Managing bookmarks in Netscape is much the same as working in the Windows Explorer area as explained above. From here you can create folders, sub folders, and move bookmarks into folders by selecting, cut or copy and paste, or by clicking and dragging bookmarks into folders. To click and drag, select the bookmark you want to move, click and hold the mouse down then drag. From here it should be relatively self-explanatory. Click on create folder, rename, etc buttons to carrry out tasks. The simplest thing to do is get some software that does it all for you. There is a great little program called Powermarks. It is available for download from <http://www.kaylon.com> It is shareware. That means you can try it out for free, but you are supposed to eventually buy it if you like it.